For example, consider the following configuration of the audio system. An example configuration of the audio system to play music and a sound. Since we have two mixers, with the sample instances connected to a different mixer than the audio stream, you can control the volume of all the instances independently from the music by setting the gain of the mixer / stream. Having two sample instances lets you play two copies of the sample simultaneously. Events sent by al_get_audio_stream_event_source or al_get_audio_recorder_event_source. Sent when a stream fragment is ready to be filled in. See al_get_audio_stream_fragment. Sent when a stream is finished. Sent after a user-specified number of samples have been recorded. Convert this to ALLEGRO_AUDIO_RECORDER_EVENT via al_get_audio_recorder_event. When going from mono to stereo (and above), the mixer reduces the volume of both channels by sqrt(2). When going from stereo (and above) to mono, the mixer reduces the volume of the left and right channels by sqrt(2) before adding them to the center channel (if present). 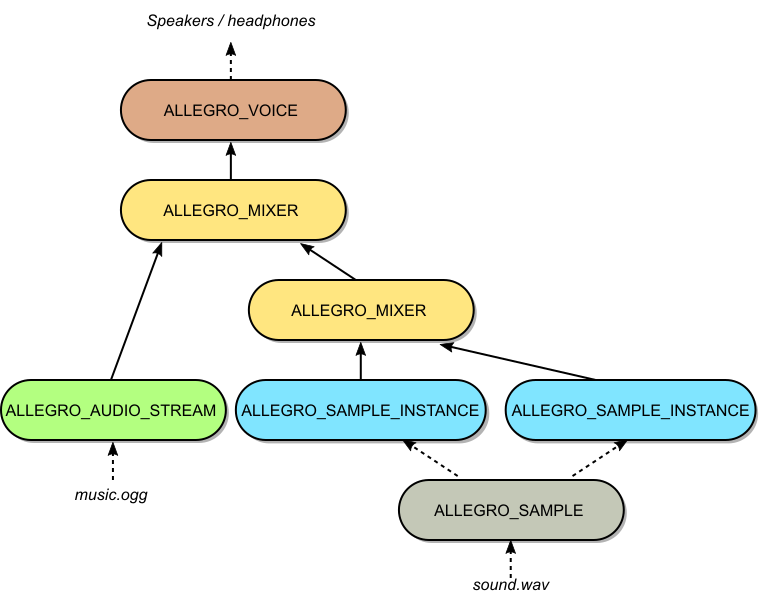 An ALLEGRO_SAMPLE_ID represents a sample being played via al_play_sample. It can be used to later stop the sample with al_stop_sample. The underlying ALLEGRO_SAMPLE_INSTANCE can be extracted using al_lock_sample_id. If you call this function a second time with a smaller number of samples, then the excess internal sample instances will be destroyed causing some sounds to stop and some instances returned by al_lock_sample_id to be invalidated. Creates a voice structure and allocates a voice from the digital sound driver. The passed frequency (in Hz), sample format and channel configuration are used as a hint to what kind of data will be sent to the voice. However, the underlying sound driver is free to use non-matching values. For example, it may be the native format of the sound hardware. Return the frequency of the voice (in Hz), e.g. 44100. Where L and R are the intensities for the left and right channels respectively. A single sample, then, refers to the LR pair in this example. ret_id - if non-NULL the variable which this points to will be assigned an id representing the sample being played. If al_play_sample returns false, then the contents of ret_id are invalid and must not be used as argument to other functions. See also: ALLEGRO_PLAYMODE, ALLEGRO_AUDIO_PAN_NONE, ALLEGRO_SAMPLE_ID, al_stop_sample, al_stop_samples, al_lock_sample_id. Locks a ALLEGRO_SAMPLE_ID, returning the underlying ALLEGRO_SAMPLE_INSTANCE. This allows you to adjust the various properties of the instance (such as volume, pan, etc) while the sound is playing. This function will return NULL if the sound corresponding to the id is no longer playing. While locked, ALLEGRO_SAMPLE_ID will be unavailable to additional calls to al_play_sample, even if the sound stops while locked. To put the ALLEGRO_SAMPLE_ID back into the pool for reuse, make sure to call al_unlock_sample_id when you're done with the instance. Unlocks a ALLEGRO_SAMPLE_ID, allowing future calls to al_play_sample to reuse it if possible. Note that after the id is unlocked, the ALLEGRO_SAMPLE_INSTANCE that was previously returned by al_lock_sample_id will possibly be playing a different sound, so you should only use it after locking the id again. Return the frequency (in Hz) of the sample. Return the frequency (in Hz) of the sample instance's sample data. Set the matrix used to mix the channels coming from this instance into the mixer it is attached to. Normally Allegro derives the values of this matrix from the gain and pan settings, as well as the channel configurations of this instance and the mixer it is attached to, but this allows you override that default value. Note that if you do set gain or pan of this instance or the mixer it is attached to, you'll need to call this function again. Returns true on success, false on failure (e.g. if this is not attached to a mixer). Creates a mixer to attach sample instances, audio streams, or other mixers to. It will mix into a buffer at the requested frequency (in Hz) and channel count. Sets the default mixer. All samples started with al_play_sample will be stopped and all sample instances returned by al_lock_sample_id will be invalidated. If you are using your own mixer, this should be called before al_reserve_samples. Restores Allegro's default mixer and attaches it to the default voice. If the default mixer hasn't been created before, it will be created. If the default voice hasn't been set via al_set_default_voice or created before, it will also be created. All samples started with al_play_sample will be stopped and all sample instances returned by al_lock_sample_id will be invalidated. Attaches the mixer passed as the first argument onto the mixer passed as the second argument. The first mixer (that is going to be attached) must not already be attached to anything. Both mixers must use the same frequency, audio depth and channel configuration. Return the mixer frequency (in Hz). Set the mixer frequency (in Hz). This will only work if the mixer is not attached to anything. Note: The callback is called from a dedicated audio thread. frag_samples - The size of a fragment in samples. See note and explanation below. Return the stream frequency (in Hz). Like al_set_sample_instance_channel_matrix but for streams.